Cloaked in a cool mist that hangs in the early morning air, the town of Luang Prabang feels like a town long forgotten by time. 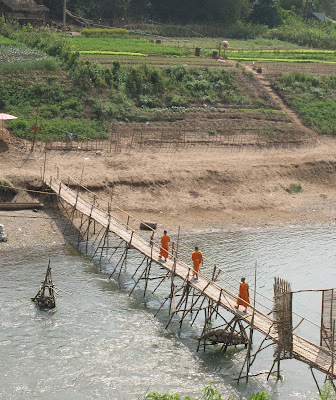 It floats between the Mekong and one of its tributaries, a town wedged between the gentle mountains of Laos’ far north, which makes for some awesome panoramic views. At 4 a.m. bells sound within the walls of each temple and processions of orange-clad monks march single file though the streets. Shopkeepers and housewives give them food offerings and receive a blessing in return. 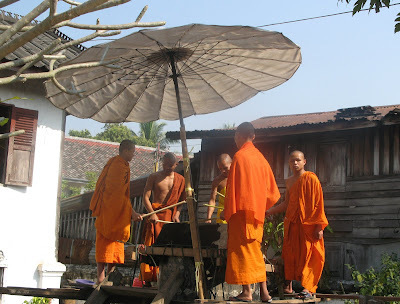 This Alms ceremony is duplicated in many Asian Buddhists countries but nowhere is it as serene as on the streets of Luang Prabang. The most popular attractions are the dozen or so Buddhist temples, all meticulously restored with help by the UNESCO Foundation, and each one is a site to behold. 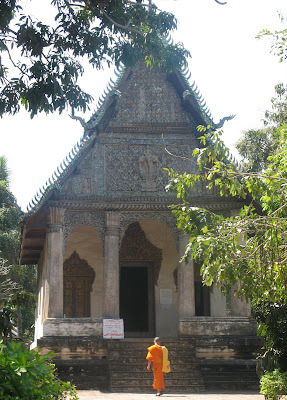 But UNESCO declared not just the temples as a world heritage site, they included most of the town. They did that, no doubt, to preserve the unique ambiance of this wonderful place. 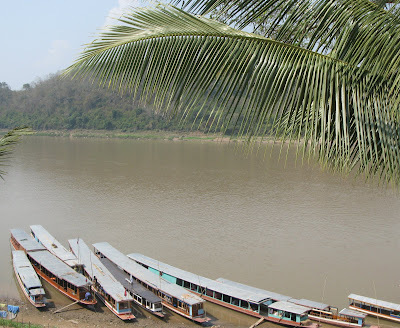 Boats for hire lined up along the Mekong. Even with the intrusion of this modernization, thousands of tourists descend on the little town to take in the scenery, the beautifully restored Buddhist temples, and quite simply, its charm. Glancing through open, wooden doors and into sturdy brick and plaster homes, it is common to see four generations of family members clustered around low tables, sharing a meal of steaming bowls of noodle soup called Khao Soy. The glare of TV screens projecting the latest Hong Kong dramas, via satellite, glows on their faces. Most tourist who visit the town stay two or three days, which is plenty of time to hire a tuk-tuk and see all the major temples, ride down the river to the Buddha cave, swim at the waterfall upriver of the town, and to visit the popular night market. For us, however, this town is a getaway, a place to rejuvenate. Both times we have visited the town we have stayed two weeks. This is a town we like to consume by small sips. We walk every inch of it. We not only visit the temples, we meditate in them, talk to the monks, spend time in the gardens under the shade trees watching the comings and goings, and listening to the chanting in the evening. 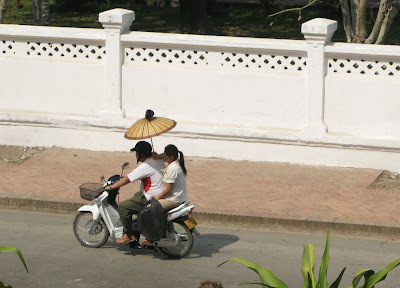 For us, Luang Prabang is a place to hang loose and take in the local flavor. It’s a place where the most stressful activity is deciding where to eat. The restaurants are excellent, but we more often than not eat in the back alleys from street vendors, where a bowl of khao soy or a plate of grilled chicken or fish can be had for less than a dollar. 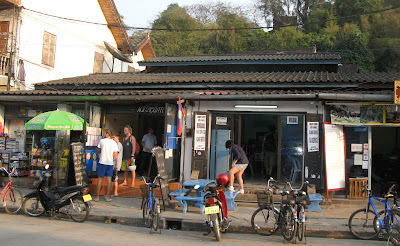 Yes you can pay for things in dollars here, as well as Thai Baht, and of course the local currency (Kip). As the sun raises over the mountains, women carry baskets of vegetables on their heads past dogs sleeping under shade trees and hens scratching along the side of the road. They carry these baskets to the back alleys that serve as the morning market. 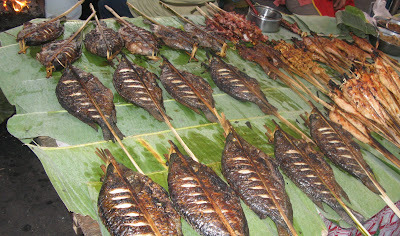 They lay out their produce, ducks and chickens, live fish, frogs, and dried insects on mats that cover the road. Then the high-pitched melodies of haggling voices echo through the town. But then the whine of motorbikes shatter the peaceful morning air and you are reminded that this town has all the modern conveniences, whether you want them or not. 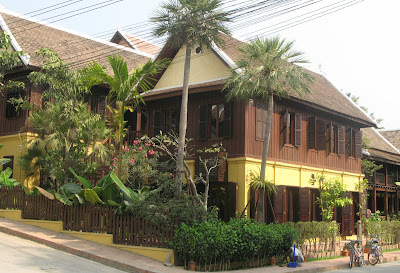 One of the new upscale guesthouses in town. 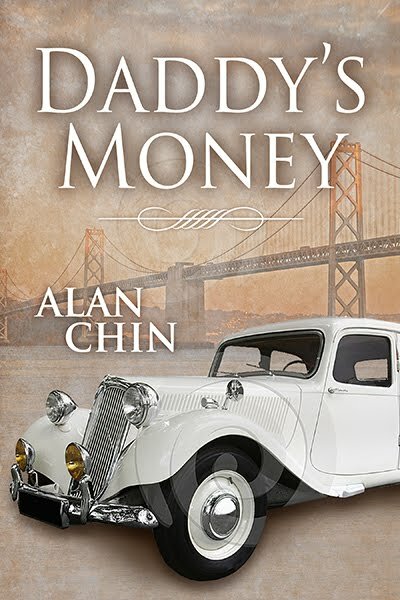 They'll even pick you up in a vintage Mercedes. It'll cost you though. Shopping for dinner? 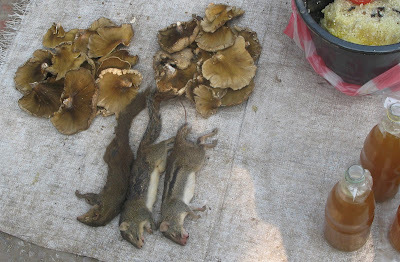 Fungi, Honey, Alvin, Theodore, Simon? Spicy dried seaweed. Very popular here although I'm not sure if the typical tourist knows what to do with it. 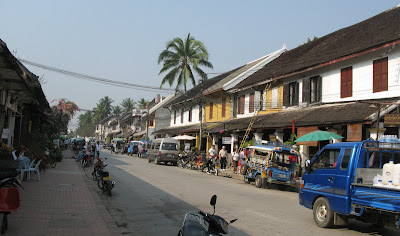 The Main Street - Sisavangvong Road, the tourist end. 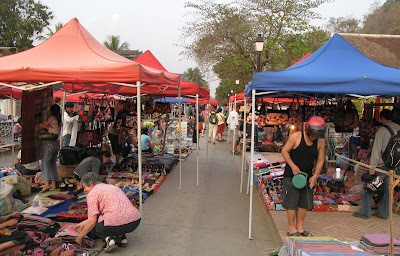 Another chief attraction is the vibrant night market, where each night the main street of the town is blocked from traffic and artists from surrounding villages bring in their handicrafts, spread them on mats covering the street, and begin to haggle with tourist. Don’t let their innocent faces fool you, these villagers are savvy traders. Stalls are filled with rolls and rolls of shawls, scarves, paintings, and sa paper lamps which are pretty much “same same, but different”. Bargain wisely but be assured that each vendor knows exactly what the bottom price for any item is throughout the marketplace. For many years this has been a haven for backpackers, but in the last few years many high-end guesthouses have opened and older, well-to-do tourists and families are taking over. And unfortunately, with the more affluent tourists, a nightclub scene has sprung up and the thump of rap music can be heard at night. This, along with other changes to cater to high-end families, is causing the town to lose some of that charm that first attracted us. To me, it feels like it’s slowly turning into the type of tourist filled towns commonly seen in Thailand, where every third person you pass on the street is asking you if you want to go to the elephant camp. It's still pretty much a backpacker's destination with an abundance of low end guest houses to attract them. 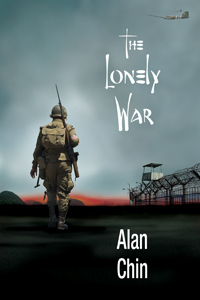 It's probably the place to lose your Lonely Planet guide though. Recommended guest houses are probably filled with the loud Lonely Planet crowds and quiet comfortable rooms are just around the corner. Just drop in and ask to see a room. 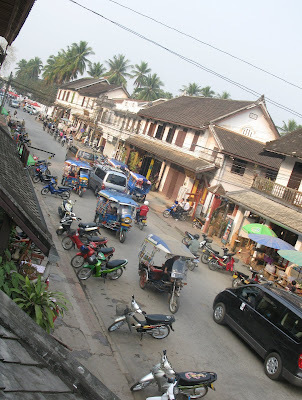 Yes, Luang Prabang is full of tourists, and many of them still are backpackers. 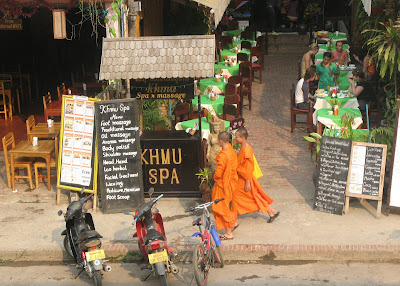 It’s still a wonderful place to visit, but if you plan to holiday in Luang Prabang, don’t wait too long. 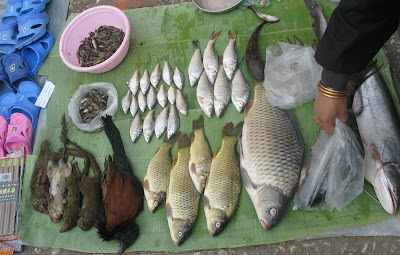 * The local currency is Laotian kip, but US dollars and Thai Baht are accepted by many merchants. * If you're staying at a higher-end hotel, airport pickup will most likely be arranged for you in advance. Tuk-Tuks can be hired for around $5.00 from and to the airport. 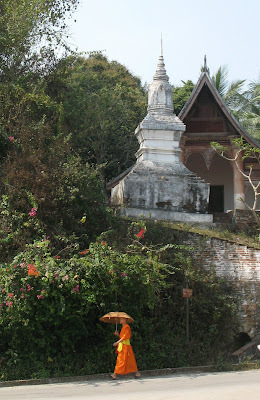 * Luang Prabang is pretty compact and a two or three day stay should be enough time to take in most of the sights. Budget accomodations are plentiful as guesthouses are the rule here. There are no large commercial hotels. * Rent a bike for a buck or two and pedal your way around town. It's relatively flat. 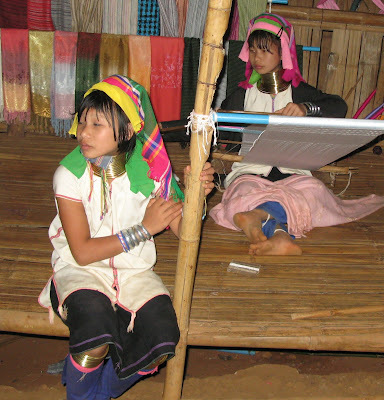 Karen (Kariang, Yang), Hmong (Meo), Yao (Mien), Akha (Ekaw), Lisu (Lisaw), and Lahu (Mussur). These are the six main hill tribes originating from China, now living in countries like Burma, Laos, Vietnam, and Thailand. Nowhere are they more visible than in Thailand, particularly Northern Thailand. 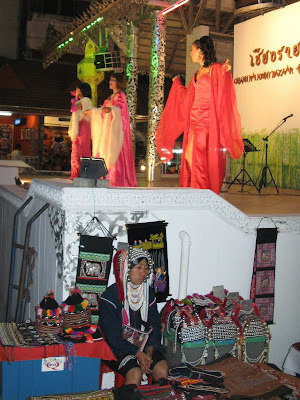 You're likely to encounter hill tribe merchants selling their wares in any major tourist night market throughout Thailand (If only they would sell something I was interested in purchasing). 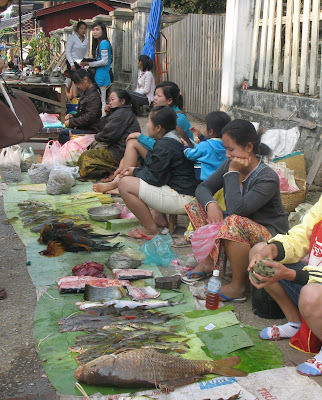 In Thailand, for years we believed they were essentially exploited by the local people for personal profit. 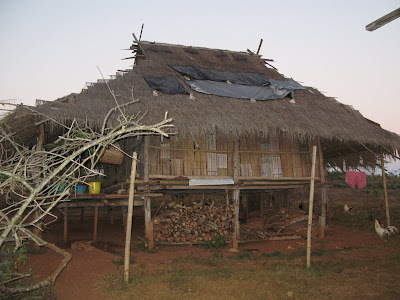 We heard stories of hill tribes confined in remote areas simply as a tourist attraction. This was especially true for the Karen Hill Tribe women with their unusual ringed neck ware. 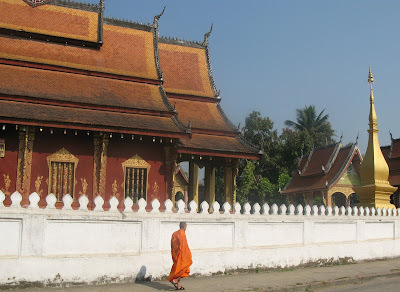 So while in Chiang Rai, we booked a day trip up the the Golden Triangle, with "stops along the way". The day trip took all of ten hours winding it's way through gardens, the northernmost point of Thailand, Opium museums, temples, a boat trip across the Mekong into Laos, and of course, the Golden Triangle where the borders of Thailand, Laos, and Burma (Myanmar) come together. On our way back to Chiang Rai, we were told our last stop was to visit the hill tribes. We didn't ask to see the hill tribes but we went along. Driven to a remote area just outside Chiang Rai we arrived at one of the local Hill Tribe encampments just as it was getting dark. The place was definitely set up for tourists but aside from our small group of seven there were none around. 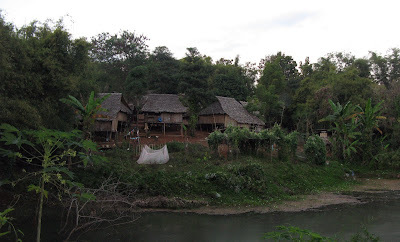 This particular encampment housed four different hill tribes, the Akha, Hmong, Lisu, and Karen. The each had their own staging area where they would perform a customary dance. All except the Karen. An Akha Hill Tribe merchant at the Chiang Rai Night Market. The Akha are probably the most visible with their unique head wear. When visiting, you're encouraged to have your picture taken with the Hill Tribe women. A donation is encourage and give you should. Karen girls begin the process of stretching their necks rather early in life. The rings are actually a solid brass coil and at adulthood could weigh up to three kilos. 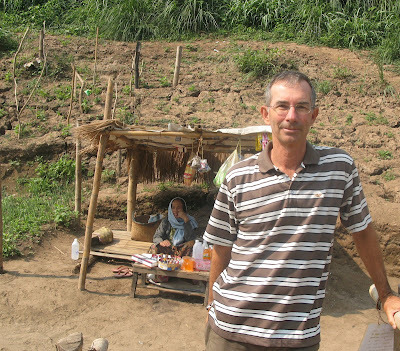 We came away with mixed feelings visiting the Hill Tribes in these encampments. It's all a big show as many things are for the typical tourist. The encouraged donations certainly would benefit the people. If you bought something from them they would benefit as well. But how much of the ten dollar per person "visit" fee would go to them? And would they benefit if you didn't visit at all? 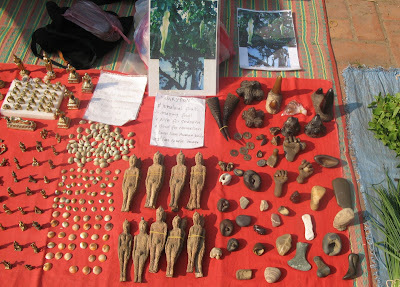 If you encounter Hill Tribe merchants, buy something from them if you can. 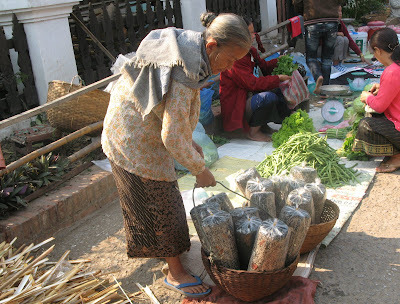 Chances are you won't just run into Karen Hill Tribe women on the streets in Thailand though. A visit will certainly educate you on these very interesting, gentle people. New Years Lanterns in Chiang Mai. In recent years, sending lit lanterns into the skies, particularly at night, seem to be taking off to celebrate one thing or another. Nowhere is it a bigger festival than New Years eve in Northern Thailand, and especially in Chiang Mai. It's still pretty much an Asian phenomenon as it's meant to bring good fortune and luck to those sending up the lanterns. We've spent New Years Eve four of the last nine years in Chiang Mai and every year it gets a little more festive. When we first stumbled upon the lanterns being sent up into the skies, we couldn't help but wonder where they all ended-up. Visions of the countryside littered with spent lanterns immediately came to mind as we witnessed hundreds, perhaps thousands of lanterns filling the night skies. It is an incredible sight though. So this year, we decided to join the revelers and we each sent up a lantern. The lanterns are made of bamboo frames wrapped with some sort of parchment paper. They're essentially hot air balloons. A waxy coil of paper is secured under the open end of the lantern and when lit, fills the lantern with hot air, propelling it skyward. You wonder why the lanterns don't just burst into flames but for some reason they make their way up towards the sky without doing so. The most dangerous thing is the hot dripping wax falling on you as the lantern begins to ascend. Surprisingly they don't burn up on re-entry. They seem pretty much intact as you find them littered throughout the city the next morning.